Please signal to the driver your intention to board an oncoming bus. Passengers are to board or alight from the vehicle at authorised bus stops only. No passenger shall attempt to board or alight from a moving vehicle. Prams are permitted on the vehicles but must be stored securely and must be clear of the aisles. All passengers are to pay the full fare prior to boarding the vehicle. Passengers must retain their ticket for the length of their journey. The operator has the right to refuse to carry any person, adult or minor or to seek to remove or remove from the vehicle any passenger who is intoxicated, drugged, dirty or behaving in a manner which is dangerous or offensive to other passengers, or who refuses to obey a reasonable request made by an Operator under these circumstances. No person shall threaten with violence or abuse or wilfully assault any passenger or operator. No passenger shall consume food or drink in any vehicle, spit, nor deface or damage either the vehicle or street furniture. No operator or passenger shall smoke any substance on any vehicle at any time. Proof of entitlement for a child concession fare must be presented to NRC before a child concession will be granted. 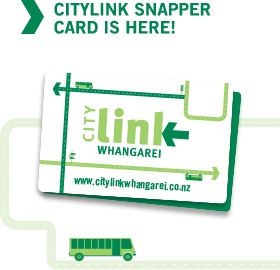 This can be a birth certificate for children aged 15 and under, or a current photo identification card from a Whangarei Secondary School for those aged 16-18. Any child travelling free of charge or on a child fare shall not occupy a seat whilst other adult passengers are standing and when requested by an Operator will vacate any seat to allow a standing adult passenger to be seated. No animals other than a properly certified service dog (or service dog under training) shall accompany any passenger on the vehicle. Neither the Company or the Regional Council accept any responsibility for any parcels, packages, luggage or other goods placed or left in any vehicle. Any incidents must be reported promptly (within 24 hours) to either the Operator or the Regional Council. No bikes are allowed on buses. All bikes should be stored on the appropriate carrier on the front of the bus.